The headlining event for a full Kansas Speedway race weekend that includes ARCA and NASCAR Nationwide Series races, the NASCAR Sprint Cup entered Friday qualifying in preparation for a 400 miles of racing Sunday. The fourth race in the 2011 NASCAR Chase for the Sprint Cup, Kansas Speedway becomes a potential epicenter for shaping what is an incredibly tight championship battle. After the past Dover race, Kevin Harvick and Carl Edwards share the top position in the Chase standings with the top-8 driver residing in a 15-point interval. With a pole position being a good launching pad for the Chase contenders for Sunday's Hollywood Casino 400 at Kansas Speedway, the efforts of the total 12 drivers were foiled by a driver and team outside of the 2011 competition within the NASCAR Sprint Cup competition. 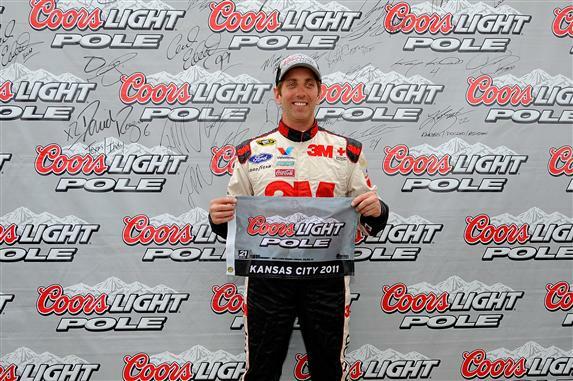 A two-time career winner of events held at Kansas Speedway, Roush Fenway Racing driver Greg Biffle steered to his second pole of 2011. Clocking a 30.877 second lap time, Biffle outran teammate Carl Edwards by just 3/10ths of a mile per hour average in the qualifying lap. Missing the 2011 Chase, Greg Biffle is still searching for his first win in the season with his #16 Ford team. In regards to the 2011 Chase championship fight in the NASCAR Sprint Cup Series, Carl Edwards 2nd fastest time grants him an immediate advantage over Kevin Harvick, Tony Stewart and Kurt Busch. The #29 Chevrolet of Harvick starts 12 place behind the #99 Ford in 14th starting spot. Kurt Busch will launch in 17th position while the #14 Chevy piloted by driver/owner Tony Stewart will roll off 23rd. The Hollywood Casino 400 at Kansas Speedway will mark the first NASCAR Sprint Cup Series start for current Camping World Truck Series regular Austin Dillon. Son of past NASCAR Nationwide Series driver Mike Dillon and grandson of powerful race team owner Richard Childress, Austin Dillon will drive a #98 Richard Childress Racing Chevrolet at the 1.5-mile oval event. Starting his first Sprint Cup event in 26th place position, its amusing to note this is the exact same spot grandfather Richard Childress' 1969 debuted as a driver in NASCAR premier series. Kansas Speedway will come alive for the Hollywood Casino 400 at 1PM local time (2PM Eastern time).